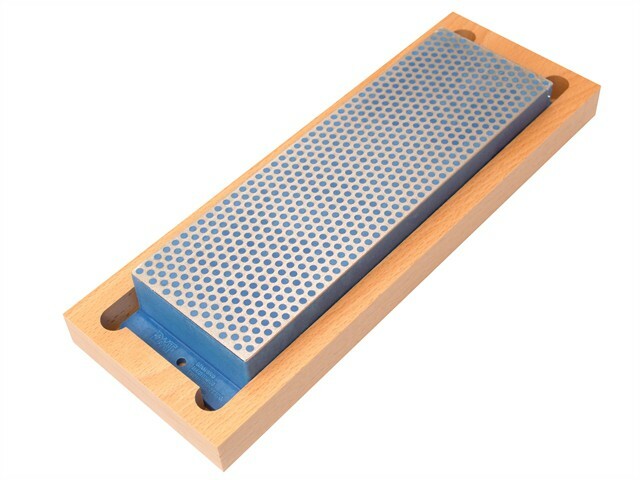 W8 Diamond Whetstones 200mm (8 in) are ideal for kitchen use and for the honing of smaller workshop tools. They have a large, wider diamond surface for sharpening a variety of knives and edges. They are supplied with a non-skid hardwood case, and tabs for permanent mounting are moulded into the stone's base. Black: Extra Coarse Grade 220, 60 micron. Blue: Coarse Grade 325, 45 micron. Red: Fine Grade 600, 25 micron. Green: Extra Fine Grade 1200, 9 micron.